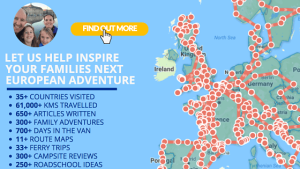 After 3 years spent discovering first hand experiences of Europe’s most unmissable destinations, campsites, educational experiences and family adventures. We’ve finally found a group of campsites we can trust to make it a memorable stay…. Why not check out these first hand reviews to make your own minds up…. But if you still need convincing, our girls shriek with delight when we tell them tomorrow’s a ‘Leading Campings’ campsite… I wonder if your family will feel the same….? Motorhoming in Italy | Camping overnight inside a Volcano Caldera… a first for us!